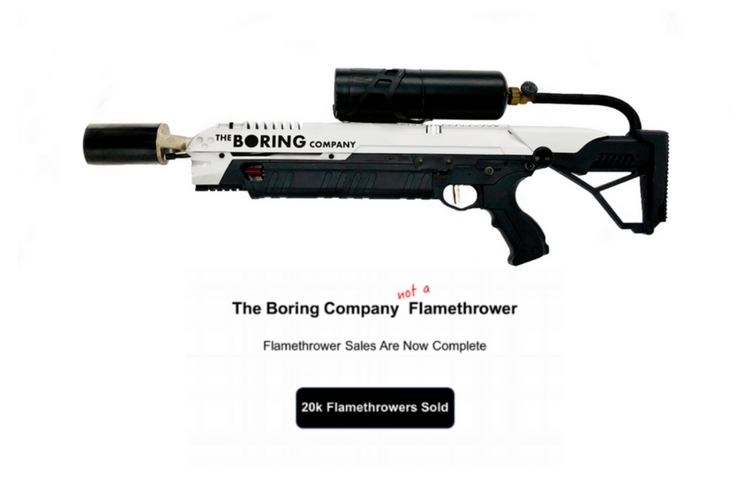 The Boring Company Flamethrower Rebranded to "Not a Flamethrower"
Tesla chief’s The Boring Company Flamethrower has certainly attracted a lot of attention over the past couple of days. The company has sold a total of 20,000 flamethrowers within a week, which is quite impressive, to say the least. Although a lot of people are excited to see such a product in existence, it may have attracted a lot of unwanted attention as well. No this isn’t a joke. The company has actually changed the product’s name to “Not a flamethrower.” In fact, the company’s website has already been altered to reflect the change. I hate to admit it, but the state assemblyman Santiago has a point here. Although the boring company’s flamethrowers are not as deadly as a military-grade weapon, I don’t think its a good idea to have a bunch of people walking in the streets with a propane tank capable of setting things on fire. Here, you can see Elon Musk firing the flamethrower and running towards the person holding the camera. Of course, he is having some fun, but it usually just takes one unfortunate mistake until it turns into a disaster. Just imagine the number of people who’ll try to imitate this video itself. It is quite alarming! As Santiago pointed out, it is probably not a good idea to have a bunch of people walk around with flamethrower in a state that just experienced one of the world’s deadliest wildfires in the history. That being said, none of this has stopped over 20,000 people from dropping a whopping $500 each on this flamethrower. In fact, a dozen of them are going for as much as $24,000 on eBay as well.